Play DVD from Mac to Apple TV But Screen Turns Grey? Easy to Solve! That's because the DVD player can't work with AirPlay streaming or mirroring due to DVD protection limitations. Luckily, there are silver bullets to save you from such predicament. 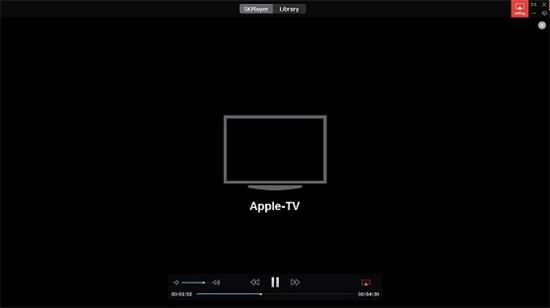 You can resort to a DVD ripper to decrypt and rip DVD to Apple TV on Mac or use Apple DVD player alternative to play DVD on Apple TV 4/3/2 via AirPlay. Both of them are simple and quick. The DVD protection made by DVD publisher or distributor is designed to protect DVD movies from being streamed, mirrored or transferred to anything that the DVD owners don't authorize. So that's why you can succeed on Apple TV with the movie you purchased from Apple Store, but end with failure with grey screen. To successfully play DVD on Apple TV, you can consider MacX DVD Ripper Pro - the world's 1st DVD ripper to conquer all the DVDs (standard or non-standard). Remove any protection from DVDs, including CSS, Region Code, UOPs, CPRM, Sony ARccOS, Disney X-project protection, etc. Rip DVD to Apple TV 4/3/2 MP4 (H264 or MPEG-4) without the bothers of protection or grey screen. High-end multi-core CPU (8) and Intel QSV tech to quicken DVD ripping 2 times faster than DVDFab, 11.8 mins to finish a 90-min DVD I AM WRATH with 185 fps. Copy Disney DVD, Sony DVD, Beachbody DVD, workout DVD, yoga meditation DVD, AV Japanese DVD, etc. with full/main title in 1:1 ratio of quality. Convert DVD disc to digital MP4 MOV MKV AVI FLV VOB AVCHD MP3 iPhone 7/Plus, iPad Pro, iTunes, iMovie, Android, etc. 350+ mobile devices. 1. Free download DVD ripper for Apple TV on your Mac or Windows PC. Fire it up and click "DVD Disc" button to import the DVD movie from your computer; DVD disc, ISO image (UDF & 9660) and DVD Folder supported. 2. Select the output format as you want. As you want to import DVD on Apple TV, you can choose "to Apple TV Video" as your output format. 3. Tap the "RUN" button to begin to rip DVD to Apple TV digital format. You can tick "Safe Mode" when ripping latest commercial DVDs and tick 2, 4 or 6 cores in CPU Core Use to accelerate DVD conversion speed. After DVD to Apple TV conversion, you can add DVD to iTunes from Mac computer and access to iTunes on Apple TV. Alternatively, you're able to move DVD movies to a thumb drive or USB flash drive and then stream DVD to Apple TV via USB port. Notice: You're supposed to use this DVD ripper for Mac to rip and play DVD on Apple TV for legal personal use, instead of illegal reproduction or distribution of copyrighted content. Please obey your local DVD copyright law before doing it. DO NOT do harm to others' lawful rights and interests. When it comes to watching DVD on Apple TV, some people will advice you to use iTunes to AirPlay DVD to Apple TV 4. Without doubt, Airplay gives people a fantastic way to stream the screen from an iOS devices or Mac to a HDTV wirelessly and securely without the need for cables. Yet, where it falls down is that Airplay does not support DVD format. That's to say, you can't directly AirPlay a DVD from Mac to Apple TV. So, you should rip DVD to Apple TV on Mac first as before and find out a video player with AirPlay function to stream DVD to Apple TV. 5KPlayer, a full-featured free video player, is also an AirPlay-based DVD player which can perfectly Airplay ripped DVD movies to Apple TV with 1:1 quality. Thus, you can watch DVD on Apple TV without grey screen issues. By the way, this HD video player supports playing 4K/5K UHD videos with multi-subtitle tracks and soundtracks, YouTube videos, HD Camcorder, Blu-ray videos and more. Apparently, playing DVD on Apple TV is a piece of cake now. 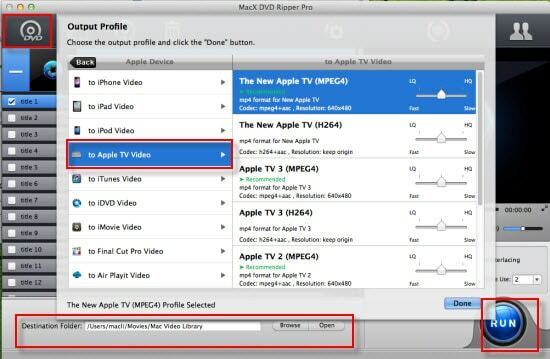 Follow the steps to stream video from Mac to HDTV. Step 2: Tap the AirPlay icon on the up-right corner of the main interface of 5KPlayer and select Apple TV as the target DVD AirPlay receiver. And if the button goes red, it means that AirPlay is successfully enabled. Step 3: Drag and drop the converted DVD file onto 5KPlayer to start playing, and the display will be shown on the screen of Apple-TV. In practical, Mac computer supports Airplay Mirroring so that you can directly stream DVD video from Mac to Apple TV. To play DVD on Apple TV, you need a Mac computer with an external USB DVD drive or a third-party DVD player because Apple DVD player doesn't support playing most of DVDs due to copyright. Hence, you are suggested to use VLC for instead. Step 1: Go to "File > Open Disc…" in VLC to play your DVD. Step 2: Enable AirPlay Mirroring on Mac: Open "Settings" on Apple TV to turn on AirPlay > Check "AirPlay Display" settings in system preference on Mac to make sure it is enabled > Click AirPlay button and select Apple TV > Tap the AirPlay button again and choose "Mirror Built-in Display". Later, you can view your DVD contents on Apple TV 4/3/2. And if VLC won't play, you can take advantage of the former 5KPlayer to play DVDs. # Mac computer models: iMac (Mid 2011 or newer), Mac mini (Mid 2011 or newer), MacBook Air (Mid 2011 or newer), and MacBook Pro (Early 2011 or newer). Wanna rip DVD to Apple TV with high video quality? 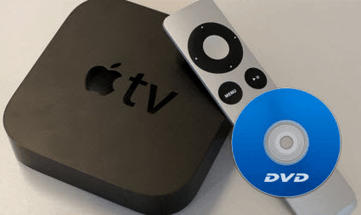 Well, this tutorial will give you tips and tricks of how to easily put DVD on Apple TV with the best Mac DVD to Apple TV converter. Good news - Apple updated its DVD Player app to 64 bit. It's quite easy to play DVDs on Mac with a DVD drive, and it's not complicated if your Mac doesn't have a disc Drive. MacX DVD Ripper Pro is the best DVD ripper for Apple TV which can freely copy and rip any new copy-protected DVDs to various video formats (MP4, MOV, MKV, AVI, etc) and portable devices with original quality.